Here are the 6 steps I used to transform my business including my exact numbers and specific hacks. Let me tell you the story of two businesses that are exactly the same-except for one simple difference. Each company starts off with $100 in capital. One has a one-month sales cycle (i.e., people go from prospect to client in one month). The other company has a four-month sales cycle. Not surprisingly, the slower business brings in less over time. But do you know how much less after one year? It only brings in $800 in revenue, while the faster business sees sales skyrocket to $204,800. That’s 256 times less, just because it has a slower sales process! With the slower sales cycle, the owner can reinvest his or her earnings just four times instead of 12 times. In many ways, this is the story of my business. It used to take months to close a $279 sale. Now, it takes just 48 hours to close a $5,000 to $25,000 sale from a complete stranger. This sales-cycle difference changed everything! When I made the shift from a “slow-sales” model to a “fast-sales” model, my business jumped from $120,000 per year to $2.4 million per year. 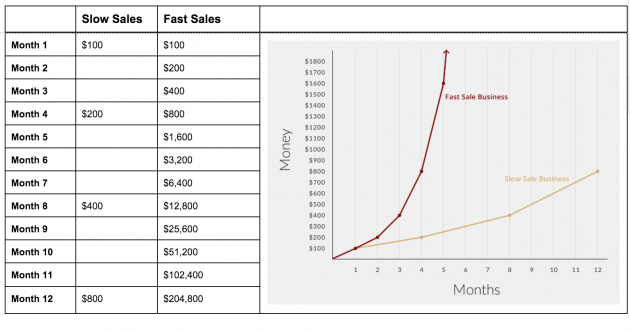 The fast-sales model is obviously better. No one would choose a slow-sales model on purpose. But many people accidentally end up stuck there. 1. Content-first marketing. The belief that I need to create blog posts, videos, and social-media posts for months or even years before I can offer my customer anything. 2. Ascension model marketing. The belief that I need to start off selling clients inexpensive products before I can sell them more expensive ones. You don’t need to create months of content before someone will purchase from you. You don’t need to build a tribe. You don’t need to sell a low-price product to eventually get someone to purchase a high-price one! All you need is a properly designed sales system that actually works. In this article, I share my exact sales system along with specific numbers and hacks you can immediately use to start to get sales fast. Every month, I spend $15,000 to $20,000 on Twitter and Facebook ads. There are a million ways to target people on Facebook or Twitter, but what’s worked best for me is problem-based targeting. I target people based on whether they have the specific problem that my product solves. I explain the power of the problem-first approach in my previous article. While Facebook and Twitter don’t yet have a way to explicitly target customers with the problem you solve, there is a way to do this indirectly. You can target people by the specific Facebook Pages they follow. Why does this work? If someone follows a niche company that only addresses the exact problem that my company focuses on, then I can be confident that this follower has that problem too. On the other hand, if they follow a very general Facebook page, say a popular musician’s, then I don’t really know if they have that problem or not. 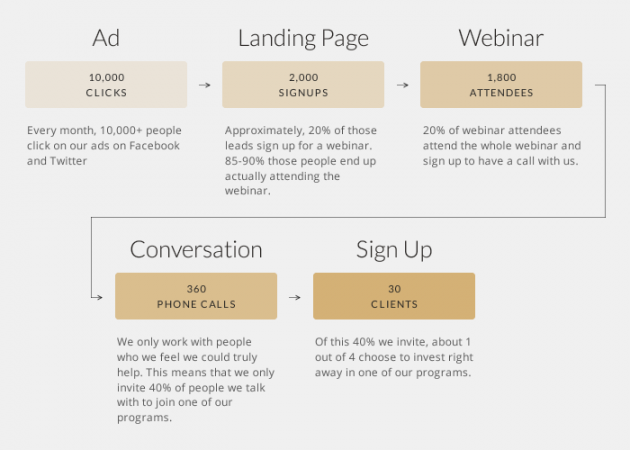 Our focus here is driving people to register for a free webinar. In order to do this, we focus the ad on the outcome that potential customers want. This could be a goal they want to achieve, a problem they want to avoid or solve, or both. The more attractive the outcome is for that potential customer, the more powerful the ad will be. Clearly showing what people get is one of the most critical elements of an effective headline. MEC Labs has conducted tens of thousands of headline tests over 15 years, and they came to the same conclusion when they shared their five key findings. 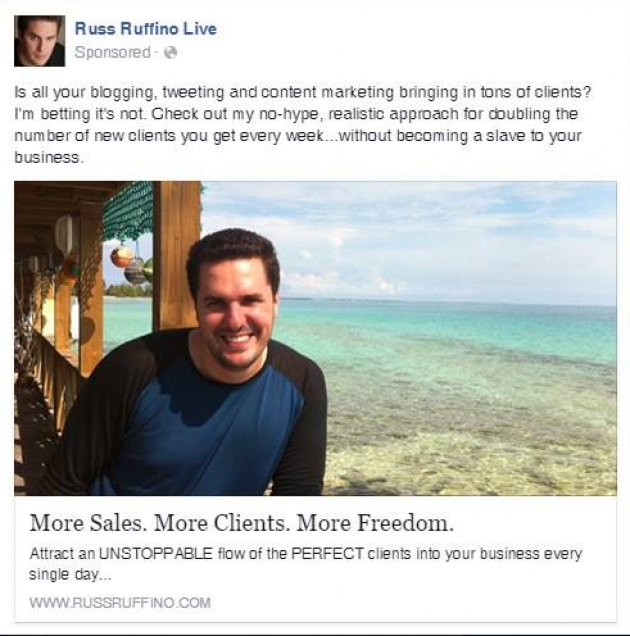 Note that the outcome is crystal clear: double the number of new clients you get every week. That’s a great hook, and it’s right in line with what we do for the people we work with. From my advertisement, I link to a landing page for my webinar. Only one link to click on the whole page. Most Web pages provide a navigation bar and lots of different paths for visitors to follow. Good landing pages are designed to get visitors to do only one thing. That one thing could be purchasing a product, providing an email address, or signing up to a webinar. This free Landing Page 101 course walks you through tips on creating a landing page. If you’re just getting started, I recommend using LeadPages to create your landing page. It completely automates the process. Goal-based and problem-based headlines. There is no replacement for deeply understanding the problems your audience faces and the goals they want to reach and speaking to them. Over 10,000 studies by psychologists in the last two decades show the power of approach and avoidance as central drivers of motivation. So, the power of this formula is that it speaks to each of these. Extensive Testing. I spend weeks testing the headlines on this page. With a tool like LeadPages, you can very easily A/B test different headlines. I’m always surprised at the results of testing. The test that wins is often one that I wasn’t expecting. That’s why it’s critical for even the most experienced marketers to constantly test. I added a countdown timer. There is a timer that counts down to the next showing of the webinar. This gives a 10 percent to 15 percent bump in conversion for me.The idea of a countdown timer has been adopted in many places on the Web, including the most popular event management system online-Eventbrite-and Amazon’s Daily Deals.Academic research by respected researcher Robert Cialdini, author of Influence, shows that people value things more highly when they are less available. Having a deadline is one powerful way to create this scarcity.LeadPages makes it easy to add a countdown timer to your landing page. He explained how to do it. He helped promote it. I remember being really scared. It was the first time I had done anything like it. But I just focused on speaking from the heart. Luckily, it resonated. Half of the 110 people purchased. From that day on, I’ve been totally convinced that webinars are magical. They do the work of an entire content marketing campaign while making a direct offer. You can’t do anything else online and get a 50 percent conversion. Viewers spend more time on webinars than almost any other form of online content. The average article takes just a few minutes to read. And that’s assuming people read the whole article-55 percent of visitors to articles only spend 15 seconds skimming them. On the other hand, my average webinar is 45 minutes and over 30 percent of people stay to the end and schedule a call with someone on our team. That’s the equivalent of 15 articles of time. Webinars help you build a deeper relationship than an article can. With a webinar, you can guide listeners with your voice and images, as well as interactive tools like Q&A, group chat, etc. Webinars provide you with undivided attention. Most people come to an article because they saw it in their social-media newsfeed. Webinars are different. If they’re watching your webinar, it means that they’ve taken time out of their schedule to show up and pay attention to what you’re doing. All of these factors make webinars the perfect place to educate potential customers and make an offer for your product. In the webinar, I provide real value. I give away as much of the solution as I can in the time that I have. Great free content will get you in front of more people, and it will build a deeper level of trust with them. At the end of the webinar, I invite the people in the audience to have a one-on-one phone call if they feel my product is a good fit. People book appointments with us through the scheduling software, Schedule Once. Then, we call them at the time they select. Keep in mind that our goal isn’t to convert everyone. Throughout the webinar, we repeatedly say whom our program is NOT for. We could probably get 60 percent of people to schedule a call if we accepted just anyone. If we did that, though, we’d be wasting our time in meaningless conversations with people who aren’t a good fit. That wastes their time and ours. In a future article, I’ll explain my formula to make a high-converting webinar that’s extremely valuable for attendees and also powerful enough to drive consistent sales into your business. It filters out people who aren’t a good fit. Although it’s tempting, I’ve learned the hard way that you never should take money from the wrong people. First, if your product can’t truly help someone, then you’re doing them a disservice. Secondly, if people are NOT truly motivated to take action, then they’re doing themselves a disservice. Finally, if you have a group program, like I do, then even one bad apple can throw off the whole group’s dynamics. In the short term, this results in millions of dollars less in revenue per year. However, I have no doubt that it’s the right decision. It provides the additional coaching that we promised in the webinar. We help callers determine the ideal price that they should be charging, who their ideal client is, and the best way to reach their ideal client. This shows clients we can solve their problem, which makes them more likely to work with us. It gives us an opportunity to deliver a sales offer to potential customers who we think are a good fit. When we truly believe that we can help someone and they’re a good fit, we make a strong case for why they should move forward. Over the years, I’ve helped hundreds of entrepreneurs create sales funnels that are compelling enough to create consistent $5,000 to $10,000 sales. Some of these entrepreneurs have built businesses just as large or even larger than mine. Others have failed to get any traction. So...what is the difference between the two? It is not intelligence or skill. Fear of saying no to clients who aren’t a good fit. Fear paralyzes people and stops them from taking action and learning from their mistakes. Fear makes people settle for mediocre profit, mediocre clients, and a mediocre product. I’m not successful because I’m the smartest guy in any room. I didn’t go to an Ivy League school. I started my career as a bartender, not a venture-backed entrepreneur. But what I lack in pedigree, I’ve make up for in boldness. I spent $61,423 and several months in 2013 only doing full time designing, testing, and refining of my sales funnel. It was only after months of frustration and rejection that my sales shot up from $10,000 a month to $200,000 a month in November 2013. Over the last two years, I increased my price by 100 times. No one asked me to increase the price. I looked at the value of the information I was providing, and I knew it was worth more. I turned down $2 million in revenue this year by saying no to potential clients who I didn’t think were a good fit. I asked some clients to leave the program and refunded tens of thousands of dollars if I got a feeling that they ultimately weren’t a good fit for the program. I had high standards, even when I really needed the money. Most entrepreneurs simply aren’t willing to go through this struggle or make these tough decisions in the beginning. Are you willing to face that fear and demand what you’re worth? Are you willing to do hundreds of tests until things “click”? Look yourself in the mirror. Be honest with yourself. If you’re not ready, then stop now. You will save yourself years of false starts and mediocre results. If you are ready, then start now. Every tough decision and every test will bring you closer to the success you’re looking for.